Before we start to dig deep into the nitty-gritty of it all, I thought it would be helpful to take a step back and understand what we are getting ourselves into with this. 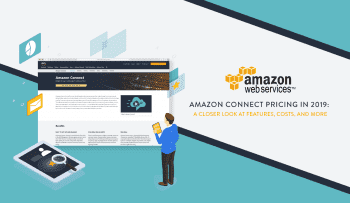 Of course, you already know by now that we will be comparing Nextiva and RingCentral, two major cloud communications providers. But we can’t leave it at just that, because cloud communications is a fairly large umbrella. And both Nextiva and RingCentral manage to reach across that umbrella and touch upon multiple forms of communication — their goal is to help revolutionize your business communications be replacing old, complicated, expensive and confusing legacy phone solutions. Both of these providers offer cloud communication solutions. At the very basic level, much of what you gain for either provider is fairly the same: a Business VoIP plan nets your company phone lines, a phone number, and a boat load of features. But how different providers break down this service will of course differ. Some charge based on the number of users, while others may charge based on included features. So, just at a glance, we can see exactly how similar Nextiva and RingCentral truly are: they both offer hosted VoIP, Cloud Contact Center solutions, Team Messaging, Paperless Faxing, and Call Analytics. 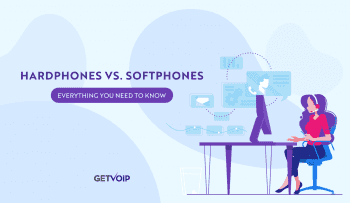 But in order to provider an in-depth comparison, we will be diving head first into a few of those categories, mainly hosted VoIP, Cloud Contact Center, and Team Messaging to gain a strong understanding of just how these providers enable your business to communicate. At the end of the day, the core service that both Nextiva and RingCentral offer are their hosted business phone solutions — just about everything else available from these providers will be complimentary to their core phone services. So that’s where we will begin, taking a close look at both providers hosted VoIP solutions. While pricing and overall features differ slightly, both providers break down their main business phone solutions, known as Nextiva Office and RingCentral Office respectively, are broken down further into multiple different tiered plans. We’ll take a look one by one at each provider, and what their different plans offer, while attempting to compare the two as closely as possible. 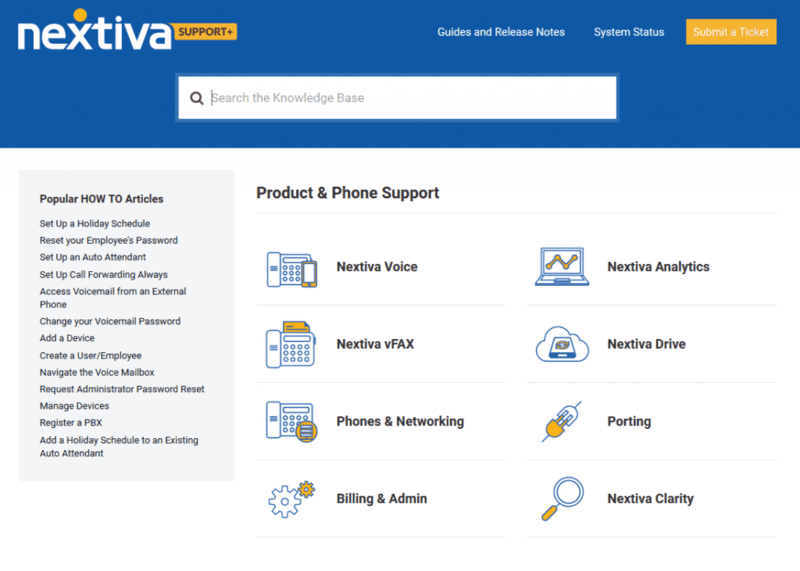 While the core service within the Nextiva Office solution is the business VoIP service, Nextiva really places collaboration at the center of their offering by providing an entire Unified Communications platform rolled into one. Users of course gain access to a Cloud PBX with advanced call management, unlimited calling, and free local or toll-free numbers. But Nextiva also includes other great features like video conferencing, web collaboration tools, conference calls, and instant messaging and presence built right into the platform. 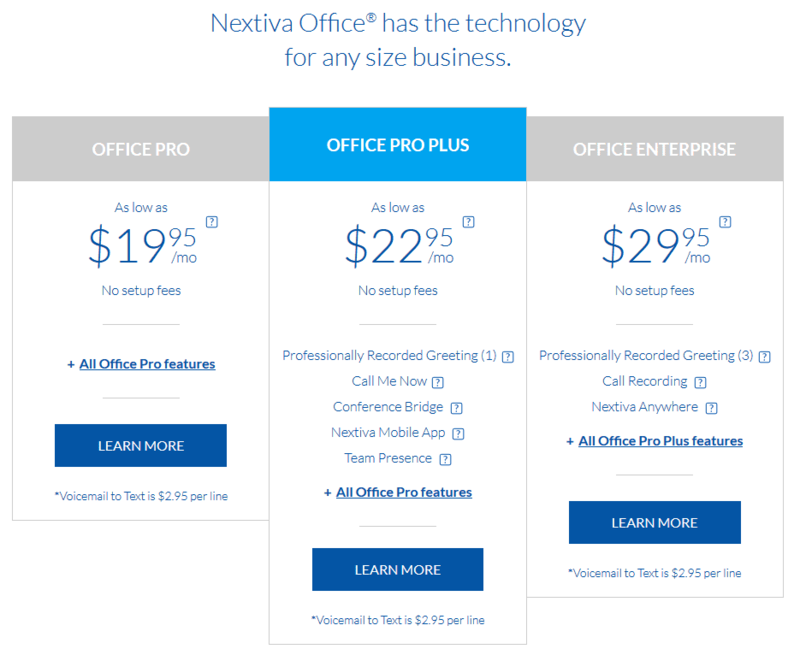 When it comes to pricing, Nextiva does things a little different: they offer three distinct plans, Office Pro, Office Pro Plus and Office Enterprise with the main differentiator being the features gained from each option. The lower cost Office Pro plan still gets your business everything it needs for a complete unified communications and business VoIP solution, but some higher end features require upgrading to a bigger plan. Let’s take a closer look at exactly everything Nextiva offers. On the other end of the spectrum, RingCentral also breaks their Business VoIP offering down into multiple different plans. 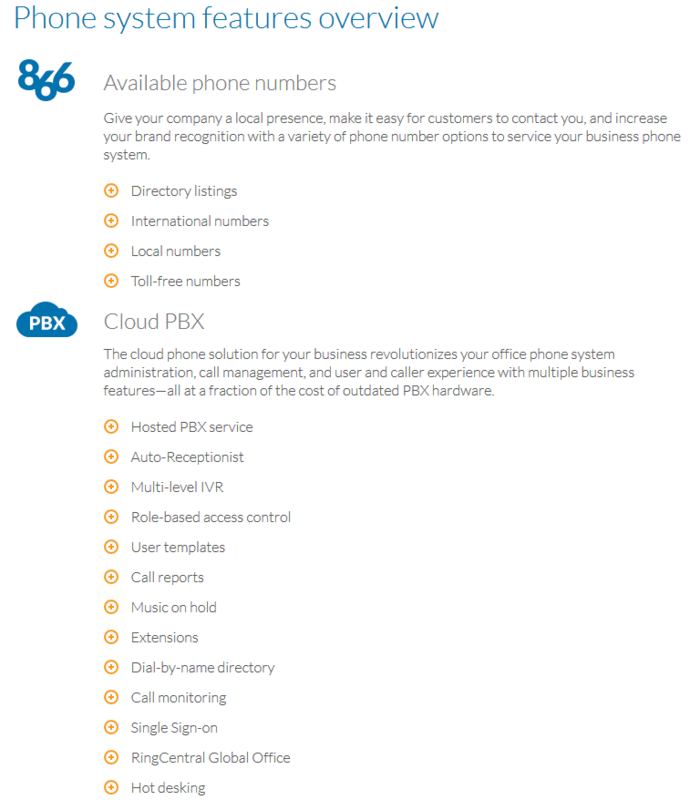 The power of the cloud PBX helps keep the cost of everything low, while providing robust and premium features at an easy to swallow price point, just like with Nextiva’s service. Again, RingCentral Office brings to the table more than just a hosted PBX, but also includes other Unified Communications tools like video conferencing, screen sharing as well as team collaboration tools with the Glip platform. This means that beyond the calling capabilities of Business VoIP, your team is also gaining access to one of the best collaborative platforms, and one of our favorite Slack alternatives. 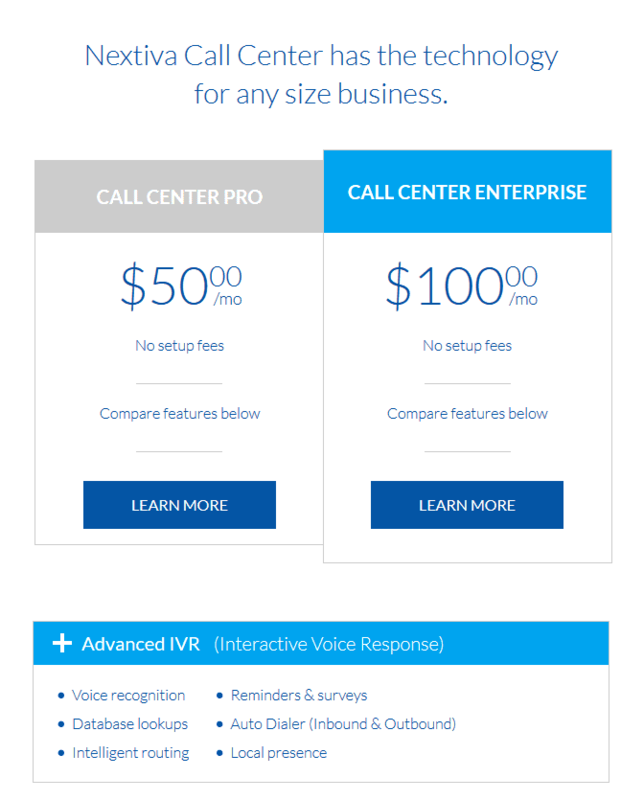 With RingCentral, users are almost gaining two platforms for the price of one. RingCentral also has an impressive list of features, just like Nextiva, for all of their plans. Pricing generally differs based on the number of seats your business requires. Lets take a closer look at the different plans RingCentral Offers. Verdict: Nextiva – Overall, both providers offer very compelling services, and either option would be a great choice for any size business. However, when you break it down and begin to look closely, Nextiva’s offerings begin to pull ahead slightly. With lower entry costs, Nextiva users gain a bit more for their money, and the plans do not get nearly as expensive as you begin to move up market. Overall, we feel Nextiva would be a great choice for any business, especially those looking to keep costs low while maintaining a professional image and service. Beyond offering your business a complete cloud hosted communications platform, both Nextiva and RingCentral make it possible to equip any business with a modern, leading edge fully functional call center. Whether your business needs a tech support center or a customer service team, or even outbound calling functionality for sales and marketing, both of these providers offer the tools your business needs to handle the large call volume and complex tasks required for a modern call center. Both providers offer standard features including IVR, ACD, and call routing, as well as outbound call management, and some more complex features like administration controls and historical reports. However, how these providers offer and bundle their solutions differs slightly, just as we saw with their business phone solutions. With two different plans available, Nextiva makes it easy and affordable for even the smallest teams to gain access to some complex features needed to run a fully functional contact center. Just from their basic plan, Call Center Pro, businesses gain robust features like an advanced IVR, and intelligent ACD, as well as skills-based and queue-based routing. Combine these features with call recording, voicemail to email, remote agent support, and even historical metrics, and even Nextiva’s entry level plan is packed with otherwise costly features normally reserved for the largest enterprise contact centers. Speaking of enterprise call centers, Nextiva’s second offering is the Call Center Enterprise, which adds in even more functionality like night & holiday service hours, whisper messages for managers to silently coach agents, and even more complex queue management as well as call management for both agents and managers. What’s also really unique about Nextiva is the availability of extra features a-la-carte. For either plan, users can add on conferencing, a supervisor dashboard, agent dashboard, or even instant messaging for little extra cost. Overall, Nextiva offers a very flexible call center solution with some really complex features, at two simple price points. Unlike Nextiva, RingCentral does not make their contact center pricing readily available online, and will require your business to receive a quote directly from a sales representative. While this might feel like a nuisance at first, the end goal should mean a more personalized and customized approach that directly fits your business’ needs. And unlike Nextiva, RingCentral takes a slightly different approach in offering the tools necessary to run a full-fledged contact center with omnichannel capabilities. 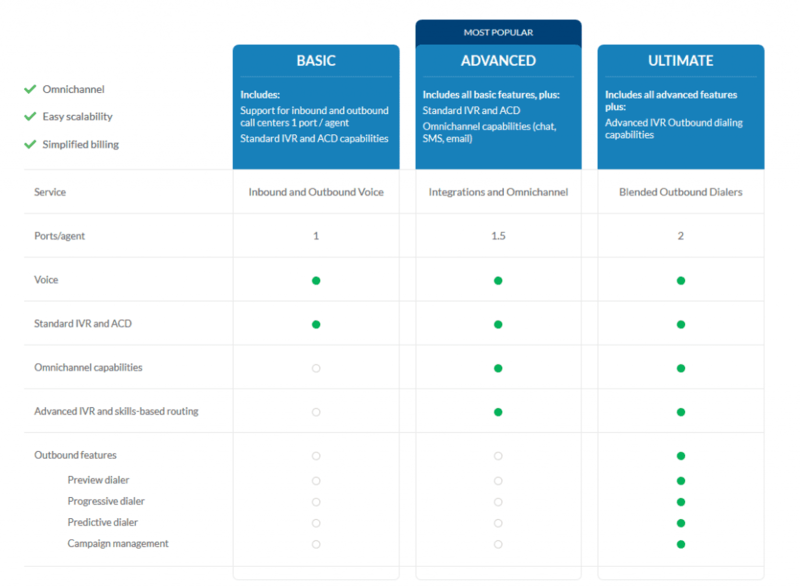 However, it is worth noting that omnichannel capabilities are limited to the second tier, “advanced” plan. Starting at the most basic level gains your business both Inbound and Outbound calling options, along with a standard IVR and ACD, and even a toll-free, local or vanity number. However, agents are limited to only one port per line, and more advanced routing options are limited to higher plans. Moving up the list of course gains omnichannel capabilities for web chat, SMS and email support. Other features are also available, including predictive and progressive dialers, advanced agent management and both real-time and historical reporting. Overall, RingCentral offers a complete and total contact center solution capable of handling multiple channels and even outbound calling. Verdict: Draw – It would be easy to award this category directly to RingCentral, but that would really just be the “short answer.” If your business is looking for a full-fledged contact center, capable of handling SMS, social media, web chat and email support, then RingCentral is the way to go. However, if your business is simply looking to utilize phone support, and offer the best options possible, then Nextiva is certainly the way to go. Now, Nextiva doesn’t necessarily have their own stand alone Collaboration app — but that doesn’t mean the necessary features are missing. What they do have are team collaboration features built directly into their platform and both desktop and mobile applications. With applicable plans, users receive the Nextiva app for instant messaging and presence functions from the same interface that you would use to manage all of your calls and contacts. Integrations help expand the platform a bit to add in extra features like file sharing. Just a note, however, this means you need to almost build a UC solution from Nextiva, choosing a plan that supports the mobile app and adding on Nextiva Drive for a possible additional cost. So while Nextiva just offers collaboration and team messaging features directly inside their existing apps, RingCentral takes a completely different approach to team collaboration. In fact, this is one of the really true unique aspects of the RingCentral platform: the addition of Glip, the provider’s team collaboration app. Verdict: RingCentral – So this one is another interesting choice, and Nextiva isn’t far off. 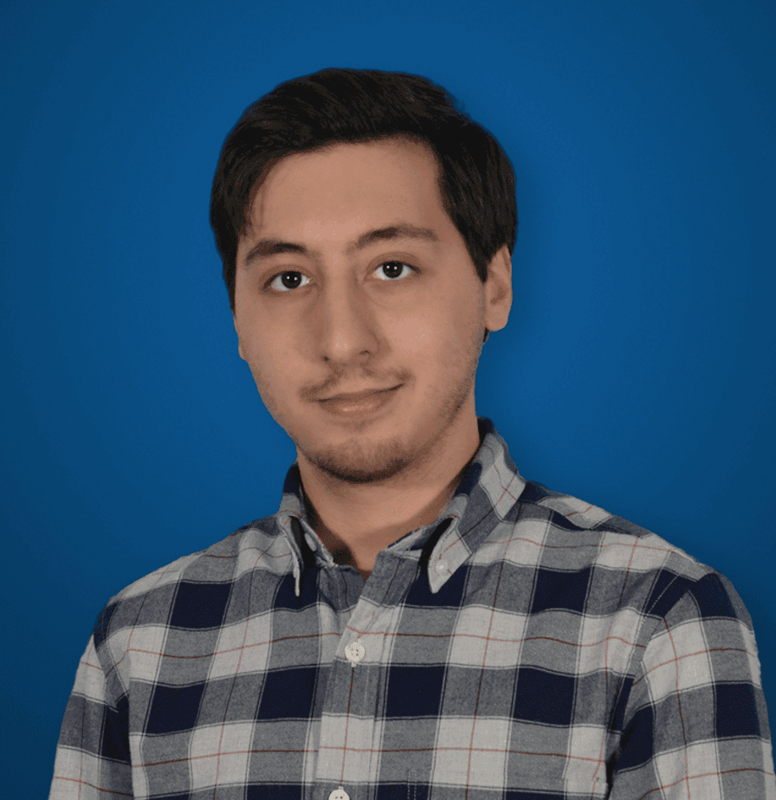 However, Glip is a really, really solid team collaboration solution and even works as a stand alone solution with some really unique functions. It is unique that Nextiva includes what are essentially collaboration functions in their standard app and softphone, with messaging and presence allow for a more seamless experience, but overall Glip just goes above and beyond when it comes to collaboration. We said this last year, and we’ll say it again: Nextiva is probably most known for their award winning customer support, right behind their constant innovation like their most recent announcement, NextOS. Of course Nextiva offers customer service through all the expected channels, as well as an entire knowledge base for those in need of help to serve themselves. This includes video tutorials, helpful guides, and frequently as question sections so that users may never even have to wait on hold for an agent. It is worth noting that Nextiva doesn’t allow users to open a ticket online, but with so many other fast methods of reaching support, or solving the issue on your own, its pretty difficult to think of a situation when one would truly need this option. What’s also very important to note is that Nextiva’s support is 100% U.S. based and in-house. None of it is out-sourced to a differently site or company. But on the other hand, RingCentral also strives to offer the best support possible for their users as well. In fact, we put together a list of all the different methods that customers can use to contact RingCentral support. Users can of course get in touch via online chat, calling or emailing support. RingCentral users can open a ticket online from the RingCentral support portal and have a representative contact them at a later time, as well. 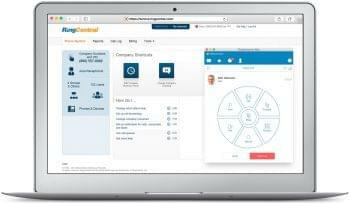 RingCentral users also gain access to similar self-service options that Nextiva customers do, with frequently asked questions, guides and videos, and even a learning center. One extra resource that RingCentral users have is access to a community forum. Here any RingCentral user can either ask or answer their own questions online, further adding to the self-service options at their disposal. Verdict: Nextiva – Look, this is a really close one for sure. RingCentral really does go the extra mile in offering their users with a great database of resources, especially the community forums. However, RingCentral does limit 24/7 support to some upgraded plans, and we can’t forget Nextiva’s award winning in-house support team. Overall, Nextiva is able to provide a complete experience all the way from the day you purchase up to those moments you need immediate help. When it comes to service availability, both RingCentral and Nextiva have their main focus right here in the United States — and you can’t blame them, that’s where they are located, and that’s their main market they focus on. However, both RingCentral and Nextiva make it possible to receive and dial out calls to international numbers, all around the globe. With VoIP, since calls are going through the internet, your business could technically just ship some IP phones over to that international office, hook them up to your Nextiva and RingCentral account and you’re off to the races. However, what really differs between the two providers is not the ability to dial out international calls, but rather the availability of different phone numbers around the globe. We’ve noticed that RingCentral is capable of offering different phone numbers from different countries, while Nextiva is more limited to just United States phone numbers. Like I said, both can still place and receive international calls, and Nextiva does allow you to send phones to Europe, let’s say, and hook them up to your account — they will just be using a United States based number. Verdict: RingCentral – In reality, Nextiva does still allow users to place and receive calls overseas. Both providers make it possible to outfit an international office with cloud communications — however customers and clients will still have to dial a United States number. On the other hand, RingCentral does promote service availability in a large number of countries outside of the United States and Canada. If your business needs international numbers specifically, RingCentral might be a stronger choice. Perhaps one of the most important aspects of a Cloud Communications or Business VoIP provider isn’t their pricing, or the features included with their plans, or even how great their support is. Before all of that, one of the most crucial aspects of any communications provider is the infrastructure powering their network, and the reliability that their setup brings. Since your business is entrusting these providers with keeping your communications up and running at all times, it is imperative that you search for a provider that has a stable, redundant and reliable network. Without that, it doesn’t matter how much money you are saving if your service never works. Thankfully, being leaders in the industry, both Nextiva and RingCentral have reliable, redundant networks behind their service. Both providers offer Service Level Agreements on top of ensuring redundancy with multiple server locations and data centers. They also both provide an “uptime guarantee” for extra peace of mind, and just in case things do go wrong, both providers offer real-time system status monitoring in order to enable your business to track network status, and identify if any issues are occurring. But beyond this, there are still quite a few differences in the networks of these two providers. Without a doubt, one of the biggest key differentiation between service provider networks is the both the location of servers, and the number of locations. Redundancy is absolute key — if one center goes down, redundancy allows operations to continue as normal by shifting the service from one location to the other. Nextiva does a great job with redundancy with 7 different server locations scattered throughout the United States. It’s also worth noting that coming later this year, Nextiva is planning to roll out two additional locations, even further bolstering their reliability and redundancy. However, where things begin to get a little iffy is when we look at Nextiva’s Service Level Agreements. They do not always engage in an SLA, and if they do the terms might be variable based on your business’ specific service plan. However, Nextiva does guarantee up time of 99.999% of the time, and as I stated, offerings a network status page for users to see exactly what service is up, what service is having issues, or any known problems that occurred in the past. Now, RingCentral isn’t exactly as transparent as Nextiva when it comes to the structure of the network powering their entire platform. RingCentral does make it known that their network is backed with full redundancy, and they do make note on their website of guaranteeing service reliability — there’s an entire section dedicated to it. 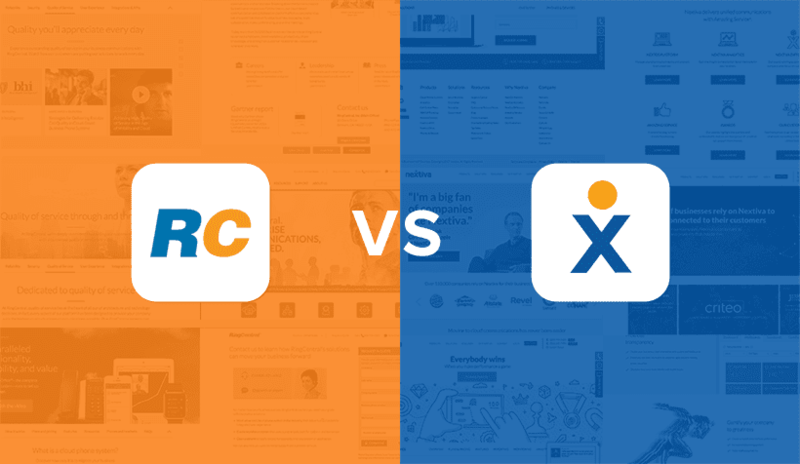 RingCentral writes that their “team of professionals proactively monitors and optimizes [their] platform 24/7/365.” However, they don’t offer the same in-depth information that Nextiva does. That isn’t necessarily a bad thing, as the provider still does engage in Service Level Agreements with clients, offering a steady peace of mind that service will stay at an agreed upon level. RingCentral, just like Nextiva, also offers the tools your business would need to gain insight into the current status of the network. Users can see the current status of the network, or any issues that are occurring, as they develop. They clearly label the “system Status” right on their Customer Care Center, but if you want more in-depth information you will have to login with your RingCentral account. With an international presence, RingCentral clearly requires more data centers than Nextiva, it’s just a little disheartening that they do not share this in-depth information with potential clients — this bit of transparency can go a long way in providing the necessary peace of mind. Overall, however, RingCentral still has a robust network and will happily enter an SLA with clients. Verdict: Nextiva – Despite the lack of an international presence, Nextiva makes it known how many data centers make up their network, the location of these data centers, and is even growing their network with two new data centers this year. While they might be iffy on their SLA’s, with 99.999% guaranteed uptime, your business might not even need an SLA. And overall, Nextiva makes it easier to track the status of their network, and any issues that might be occurring. Without a doubt, both Nextiva and RingCentral are incredibly strong choices in the Unified Communications or Business VoIP market. Both providers are clearly leaders with robust networks, competitive pricing, compelling platforms, and pushing the envelope with constant innovation. Because of this, we find it very difficult to directly recommend one provider over the other in absolutely all situations. Rather, different providers will work better for different scenarios, and what is a perfect fit for one business might not work out well for another business — each has their own unique needs and requirements. Your business is looking to keep costs down. Its a bit of a toss up depending on the size of your team and features that you need, but overall Nextiva generally reflects a better value option, offering more for less money or, the ability to customize a plan that best fits the needs of your business. Your business is looking to stay with one closed ecosystem, as there are many benefits to such an approach, Nextiva’s unique offerings like the Nextiva Drive, Nextiva Analytics and the NextOS are a great way to keep all your tools in one familiar and seamless toolbox. Do away with integrations and have everything under one roof to begin with. Your business is searching for a complete Unified Communications platform, including powerful collaboration and team messaging tools. Glip is probably one of my favorite Slack alternatives, and makes an absolute great complement to the rest of the RingCentral platform. Your business is focused on offering a multi-channel contact center. Since RingCentral offers a multi-channel contact center solution your business can deliver the most up-to-date call center experience. Excellent breakdown. Thank you for this! Nextiva is super-impressive.